The PAX’s S80 is an advanced countertop POS terminal which combines innovation­, durability and high performance to assure faster, more reliable transactions. The PCI PTS 3.x approved S80 offers advanced connectivity, equipped with various communication technologies such as GPRS / 3G (WCDMA), Ethernet and PSTN. An intuitive ATM-style interface and ergonomic keypad make operation easier for merchant and consumer alike. 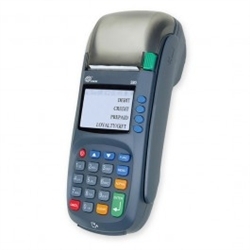 The S80 comes with inbuilt contactless and powerful ARM11 processor, enabling support for multiple payment and value-added applications, making this countertop terminal one of the most reliable in the world. Standard paper roll: 2.25 in.